"Jeff, Who Lives at Home"
Call him Mark, Who Lives On Screen. While he’s all over movie screens at the moment, Duplass would like you to take a peek at his most recent writing and directorial effort – in tandem with his brother – as it debuts on home video. 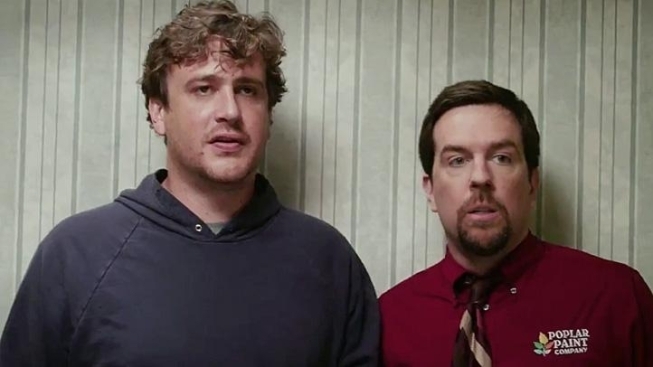 “Jeff, Who Lives at Home” casts Jason Segel as a directionless but hopeful man living in his mother’s basement and Ed Helms as his older brother, struggling to keep it together as his marriage begins unraveling. In anticipation of October’s 30th Anniversary Blu-ray release of “E.T. The Extraterrestrial,” director Steven Spielberg’s 1982 classic was screened at the Los Angeles Film Festival in all its original glory (and yes, that means government agents toting guns and not the flashlights of the digitally revised version a few years back). To mark the occasion and pay homage to the movie’s most iconic image, the Los Angeles County Bicycle Coalition sent dozens of red-hoodied fans pedaling on a trek through downtown L.A., led by 13-year-old Daniel Oakes who squired a plush E.T. in his bike’s basket. This year promises to be a Blu-ray bonanza for Spielberg aficionados, with ‘E.T.,” “Jaws,” “Empire of the Sun” and all of the Indiana Jones films set to make their debut in the format before the end of 2012. No word yet on a date for “1941,” though. June 7 marked the 95th anniversary of the birth of the legendary Dean Martin, and his fans have two more reasons to celebrate. Time-Life in 2011 had released two compilations sets featuring segments from Martin’s beloved 60s-era variety series – but with a considerable amount of musical performances cut out, due to the hefty expense of music licensing. However, the sets proved popular enough that the latest DVD collection, “The Dean Martin Variety Series Uncut” feature selected episodes in their full music flower, with all the performance sequences – including Martin’s hilarious ad-libs that often threw his celebrity guests – intact. Meanwhile, the crooner’s musical side gets a serious showcase in the deluxe box set “Dean Martin: Collected Cool,” a four-disc retrospective of his signature songs. Among the gems of the treasure trove: a full disc capturing a complete live performance in Lake Tahoe from 1962 that reveals Martin in his heyday performing in his inimitable persona, mixing up jokes about booze, broads and bad behavior amid the Neapolitan melodies; and a DVD featuring a rare 1983 performance in London which has Martin dusting off some of his best gags and improving some new ones as he entered the twilight of his career.